Pinch hitter Khayyan Norfolk’s successful sacrifice fly in the bottom of the tenth inning gave the Potomac Nationals a 5-4 victory over the Salem Red Sox at Pfitzner Stadium Friday night. The Nationals loaded the bases on Kyle Martin before the sac fly won it. Robert Benincasa picked up the victory in relief for the P-Nats. Martin took his first loss of the season for the Sox. William Cuevas started for the Red Sox, going five innings, allowing three hits and four runs, walking three and striking out five. P-Nats starter Brett Brach also received a no decision in his first appearance for Potomac. Brach went five plus innings, allowing three hits and three runs (two earned). Brach struck out seven, including striking out four in the fifth. The Nationals started their scoring in the bottom of the first. Tony Renda led off the game with a double. He reached third on a sacrifice bunt by Stephen Perez and scored on a ryan zimmerman sacrifice fly. Zimmerman went 0-3 in his first rehab appearance of the year. The Red Sox squared the game at one in the top of the fourth. Jonathan Roof and Reed Gragnani both reached on singles, setting up first and third and one out. Mario Martinez grounded into a fielders choice as Gragnani was retired at second. It was enough to bring home Roof and tie the game at one. The Nationals then took a 4-1 lead in the bottom of the fourth. A walk to Perez and a single by Oscar Tejeda set up first and third with one out. Cuevas threw a wild pitch which allowed Perez to score and make it 2-1. Later in the frame, Randolph Oduber doubled home Tejeda to make it 3-1. Oduber would move up and eventually score on two wild pitches to make it 4-1 Nationals. The Sox got Cuevas off the hook however in the bottom of the sixth. Randolph Oduber dropped a Matty Johnson fly ball to start the frame which put a runner on second and no one out. Jonathan Roof tripled which scored Johnson and made it 4-2. Gragnani would double home Roof to make it 4-3. After a groundout moved Gragnani to third, Ryan Dent’s double scored the tying run. No one would threaten to score until the tenth. The Sox started the frame with a walk to Jayson Hernandez by Benincasa. Hernandez was pinch run for at first by Dreily Guerrero. Guerrero would reach second on a groundout with two outs. Benincasa intentionally walked Gragnani to set up the force. But with Mario Martinez up, Guerrero was picked off second base on a snap throw by P-Nats catcher Pedro Severino. In the bottom of the tenth, Severino led off with an infield single. Martin would then hit Narciso Mesa to set up first and second with no one out. After a long 12 pitch at bat, Martin would strike out Renda looking. Renda was thrown out of the game for arguing the call. With one out, Martin intentionally walked Perez to set up the force and load the bases. And Norfolk, who came in for Zimmerman, hit the sac fly to center to bring home Severino and win it for the P-Nats. With the win, Salem drops 8.5 games behind Myrtle Beach with 16 games remaining. 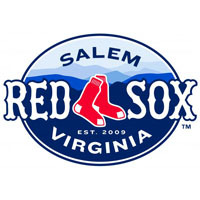 The Sox and P-Nats play game two of the series tomorrow at Pfitzner Stadium. Cody Kukuk gets the ball for the Red Sox with Dakota Bacus going for the Nationals. First pitch is at 6:35.